Nice, the capital of the French riviera, radiates a relaxed atmosphere and thanks to its mediterranean climate, picturesque old town and tangible Italian influences has a very distinct culture, making it a perfect place to take your French language students at any time of year. Year round, people can be found on the cafe terraces enjoying the popular pastime of having coffee while watching others stroll along the famous Promenade des Anglais. This famous street is always adorned with blooming flowers and offers a wonderful view of the Baie des Anges and the coastal beaches. Visit the famous "Cours Saleya" to show your students how markets are central to French life. Add in some language lessons during your stay, or visit the Chateau de Berne and you have the perfect way to immerse your students in their study of French language and culture. 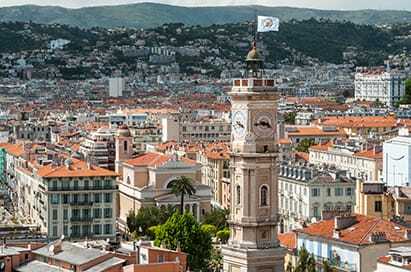 Arrive in Nice & transfer to accommodation. We have contacts with language schools in Nice & Cannes who can tailor make your lesson programme according to your requirements. A tour can be arranged round this very impressive chateau and its vineyards. The students will be given a talk on how the wine is produced and a tour of the property. Every day, except on Monday, there is a colourful food and flower market at Cours Saleya, the famous promenade in the South-West part of Vieux Nice. Considered one of France's special markets, it is a great place to immerse yourself in the sights and smells of this essential part of French life which attracts both tourists and locals alike. 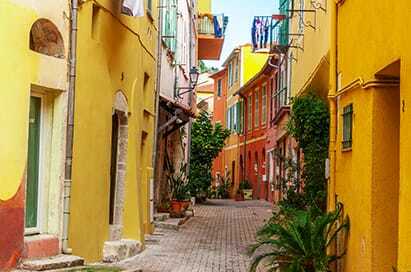 Nice’s old town, an atmospheric mellow-hued rabbit warren, has scarcely changed since the 1700s, and getting lost in it is a highlight. The thriving market square hosts a well-known flower market and a food market, a staple of local life. A flea market takes over on Monday, and the overflow from bars and restaurants seems to be a permanent fixture. Discover the secrets and traditional processes of perfume making during a guided visit of this world famous producer, who have been making perfume for over two hundred and fifty years. The group will be able to discover the impressive collection of museum pieces as well as the antique production equipment and of course buy the products at discounted prices. Built on the narrowest part of the Saint-Jean-Cap-Ferrat promontory, this sumptuous palazzo, is one of the finest listed buildings on the French Riviera. Béatrice Ephrussi de Rothschild turned her villa into a true collector’s paradise, where porcelains, paintings by the masters and furniture sat side by side. Between Nice and Monaco, the Grecian Villa Kerylos is one of the most extraordinary sites on the French Riviera. It was built in the early 1900s, in the period the French call the “Belle Epoque”, and is a quite unique and extremely luxurious re-creation of an ancient Grecian dwelling, complete with wall decorations and furniture.